“The art of nursing is expressed through the melding of nursing empathy, imagination, and creativity,” writes Judy Schaefer in the Foreword to the recently published book Learning to Heal: Reflections on Nursing School in Poetry and Prose (Kent State University Press, 2018). Among this collection of poetry and prose pieces is Sr. Frances Smalkowski’s essay “The Silent Treatment” in which she recalls the creativity and patience she discovered as she overcame fear as a psychiatric nursing student working with her patient Mr. Loy. The anthology features tales from recent nursing school graduates along with poetry and prose from those who have long ago retired, covering “an age span of about seventy-five years,” explains Editor Jeanne Bryner. A book release celebration was held on September 13, 2018 where eight of the contributors read excerpts from their stories. Sr. Frances, regrettably, was unable to attend the event. A video of the readings is available here. Copies of the book are available through The Kent State University Press. Sr. Frances entered the Sisters of the Holy Family of Nazareth in 1960. She earned a BSN and MS in psychiatric nursing and went on to become a certified chaplain. Sr. Frances currently serves as the Director of Pastoral Care at St. John Paul II Center, a skilled nursing facility in Danbury, CT, which just celebratd its 35th anniversary. 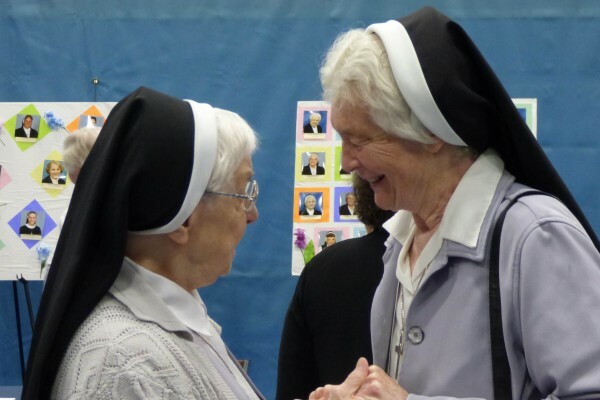 Pictured above: Sr. Frances (right) with Sr. Janice Kobierowski.